Purchase Naked & Raw Coffee Complete Skin Care Range, SLS & Paraben Free worth Rs. 1147 at Rs. 919 Only. 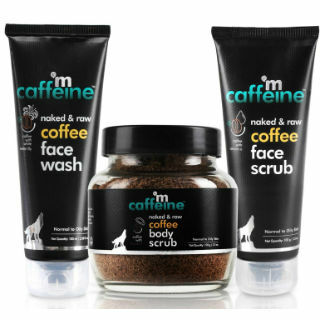 Made from pure arabica coffee and other natural ingredients, mCaffeine naked & raw coffee range is handcrafted to give you a skin that is fresh, younger looking, free of impurities, dead skin cells and blackheads. Experience a skin breathes free. Surrender to coffee and let it take care of you. Indulge in complete coffee care range to get a skin that glows and confidence that shows.